For combat veterans, entering the job market often poses several challenges—learning new job skills, competing for scarce openings, and more. Even proper business attire can be a challenge. In 2004, the late Bob Shepherd of MITRE learned that veterans were often in need of professional clothing. 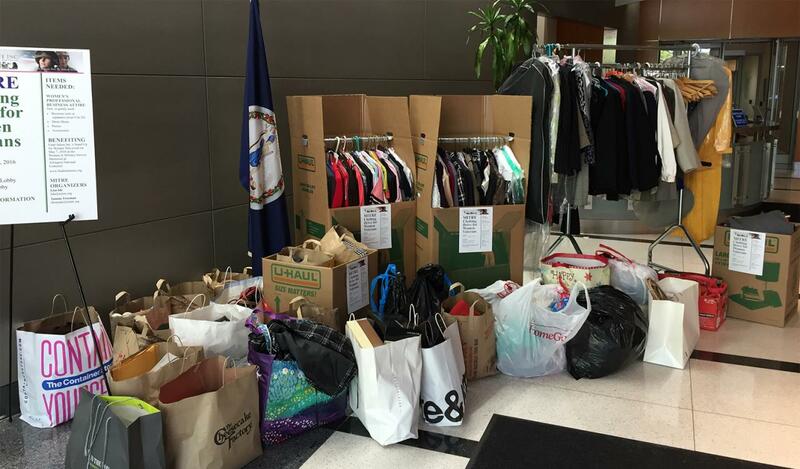 He shared this information with his co-workers, which led to a clothing drive for suits, ties, shirts, dress shoes, and other accessories. This grassroots effort evolved into an ongoing initiative known as Suits for Vets. Today, Suits for Vets includes partnerships with Walter Reed National Military Medical Center and Jos. A. Bank Clothiers, a national retailer that provides a sizable discount to veterans. MITRE employees and other friends have donated over $100,000 to outfit more than 210 severely wounded veterans who have gone on to college or new careers. Many have expressed their appreciation. "It wasn't easy trading in my muddy combat boots and dirty Army uniform for a clean sports coat and crisp pressed slacks," wrote one participant. "But that's what I wore for my job interview, and they must have liked my appearance, because I was hired!"